Triple layers of horse loving fun! 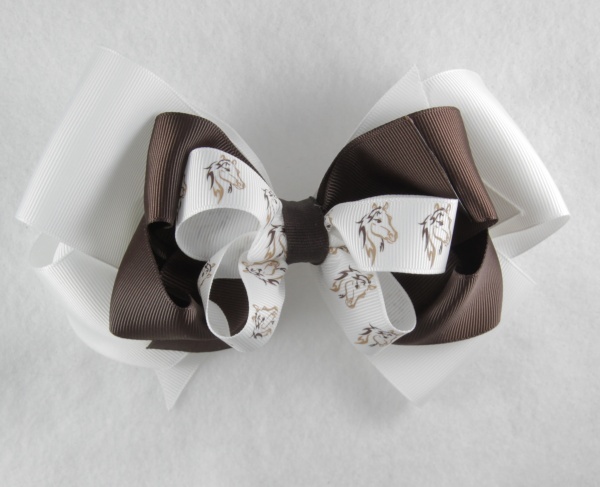 Doll up your little horse lover's outfit with this great bow. There is a large 2.25" white grosgrain ribbon on the bottom, then a 1.5" chocolate brown ribbon and then a 7/8" white grosgrain ribbon tops it off. This has a horse face with a pretty mane that has different shades of dark and light brown. She will love showing off these pretty horses on this bow.